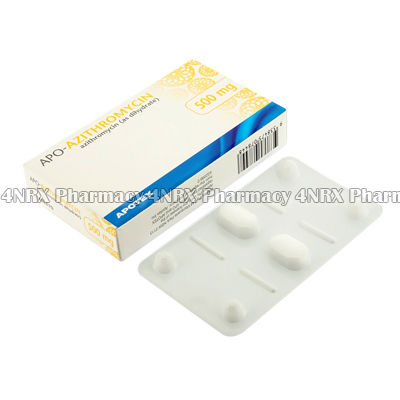 What is Apo-Azithromycin (Azithromycin Dihydrate) used for? 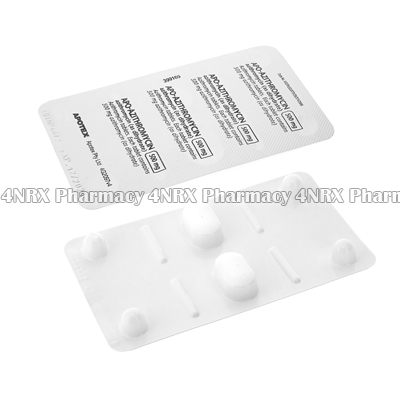 Apo-Azithromycin (Azithromycin Dihydrate) is an oral antibiotic prescribed to treat a wide variety of bacterial infections. The medication destroys or stops the reproduction of bacterial cells to allow the immune system to control he infection naturally. Commonly treated conditions include nasal infections, soft tissue infections, respiratory tract infections, urinary tract infections, or ear infections. Your doctor may also prescribe it for other purposes that are not listed here. How should I use Apo-Azithromycin (Azithromycin Dihydrate)? Strictly follow the directions of your doctor while using Apo-Azithromycin (Azithromycin Dihydrate) to get the most effective results. One tablet is normally administered once each day for a cycle of medication lasting one or two weeks. The correct dosage for your particular condition will be determined by your health, the condition being treated, and the severity of your symptoms. Do not stop taking the medication prior to being instructed to do so, even if your symptoms have disappeared, as the infection may not be gone and can relapse stronger or more resistant to treatment. Swallow the tablets whole along with a large glass of water to aid absorption. They may be taken with or without food but a meal or snack is recommended if you get an upset stomach. Never change the form of the tablets by crushing or splitting them as this may destroy or alter the effects of their contents. Before beginning to use the medication, ask your pharmacist or doctor any questions you have to prevent unexpected health problems from occurring. What are the side effects of Apo-Azithromycin (Azithromycin Dihydrate)? Serious side effects that may require immediate medical assistance are chest pain, faintness, irregular heartbeats, severe diarrhoea that is bloody or watery, discoloured stools, darkened urine, or jaundice. Immediately inform your doctor of any symptoms that are persistent or worrying to you to make sure the correct adjustments are made to your dosage to prevent further complications. Apo-Azithromycin (Azithromycin Dihydrate) should not be used to treat patients who are under the age of six or if you are lactose intolerant, have an allergy to macrolide antibiotics, or if you have had a bad reaction to similar treatments in the past. Also disclose if you have heart failure, liver disease, severely decreased kidney function, myasthenia gravis, diabetes, slowed heart rate, or if you disturbed levels of electrolytes in the blood. These conditions may require reduced dosages or other adjustments to prevent further complications from appearing. 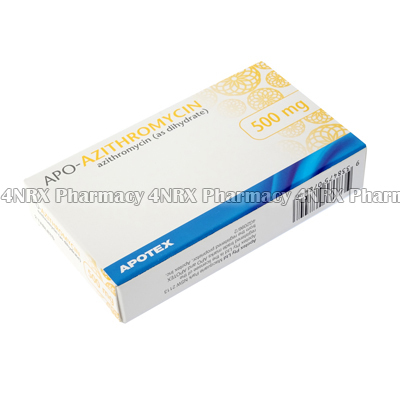 Strictly use Apo-Azithromycin (Azithromycin Dihydrate) as prescribed and follow all instructions provided by your doctor. Safe, suitable, and optimum dosage can vary and is dependent on the patient`s health and medical history, as well as the condition you are treating. Apo-Azithromycin (Azithromycin Dihydrate) may not be safe or suitable for all patients. Always ensure your doctor is informed if you are pregnant or breastfeeding, using any other type of medication (including non-prescription medicine, vitamins, and supplements), as well as if you have any allergies, other illnesses, or pre-existing medication conditions.